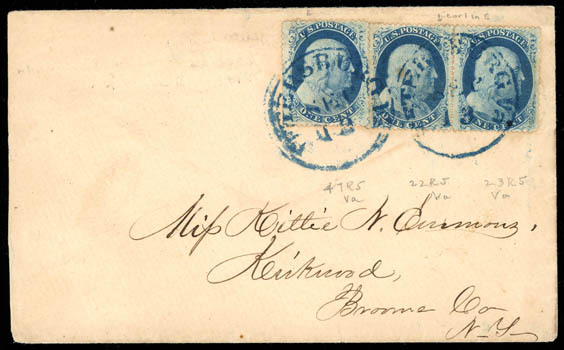 1857, 1¢ blue, type II, plate 2, used with 3¢ dull red (11A), rich color, tied by "New-York Jun 15 1861" duplex on cover to Kinderhook N.Y., original enclosed letter accompanies, stamp faults, otherwise Very Fine and rare combination prepaying the carrier fee. Scott No. 20 Estimate $200 - 300. 1857, 1¢ blue, type Va, single and pair, position 47R5 (Relief E) and 23R5-24R5 (Relief C) with position. 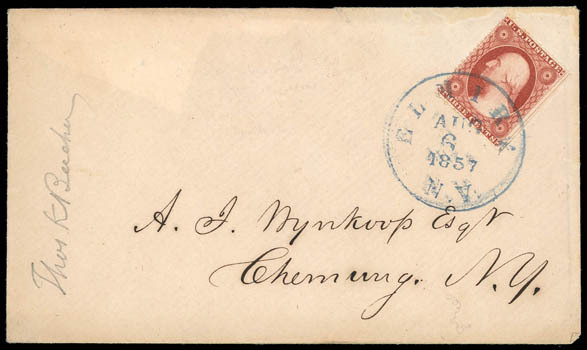 23 showing the Curl in "E" variety, tied by two strikes of blue "Petersburg Va. Sep 13" cds on cover to Kirkwood N.Y., flap with blind embossed "Wm. F. Spotswood, Apothecary & Druggist" fancy oval, original 1858 enclosure accompanies; small perf flaws, reduced slightly at left, Very Fine and scarce type Va usage, ex-Wagshal; signed by Ashbook on reverse. Scott No. 24 var. Estimate $400 - 600. 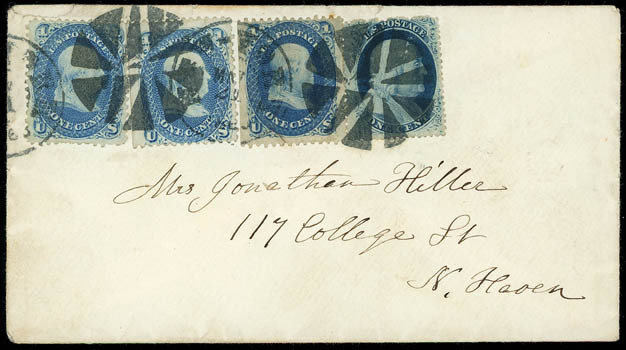 1857, 1¢ blue, type V, used with three 1¢ blue (63) singles, two with nat. s.e. 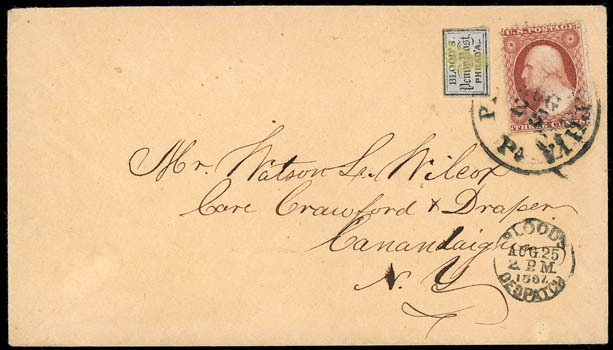 at left, tied by two bold strikes of "New-York, May 21, 1863" duplex with geometric fancy on cover to New Haven Ct.; small faults, otherwise Very Fine and rare combination franking prepaying the 3¢ letter rate plus 1¢ carrier fee. 1857, 1¢ blue, type V, post demonetized use on 1863 First National Bank check in the amount of $200, cancelled by ms. "Augst 16 /63, J.E.E. ", matching signature on check, 1¢ creased, F.-V.F. and scarce revenue use. Scott No. 24 Estimate $200 - 300. 1857, 3¢ rose, type I, used with Blood's Despatch (1¢) bronze on black (Scott 15L14), acid cancelled and tied by "Philadelphia Pa. Aug 25" cds on light buff cover to Canandaigua N.Y., "Blood's Despatch, Aug. 25, 2 P.M., 1857" cds, Very Fine and rare combination unpriced in Scott. Scott No. 25 Estimate $300 - 400. 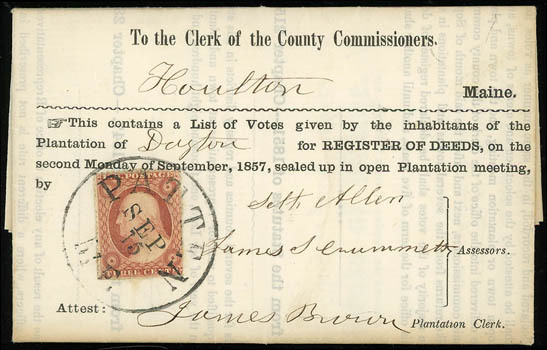 1857, 3¢ rose, type II, scissor separation, tied by neat "Patten, Me., Sep 15" cds on 1857 folded voter form document to the county commissioner in Houlton, Very Fine. 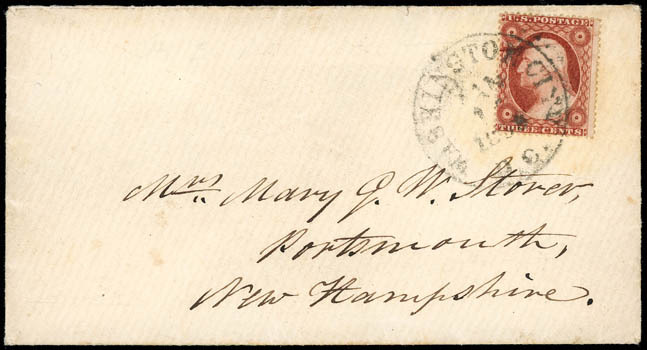 1857, 3¢ dull red, type III, Cracked Plate, position 71L18 which clearly shows large plate crack extending through the entire width of the stamp, deep rich color, tied by "Washington City D.C. Jan" cds on cover to Portsmouth N.H.; flap tear, Very Fine, a scarce on cover usage of this cracked plate variety, ex-Cochrane. Scott No. 26 var. Estimate $300 - 400. 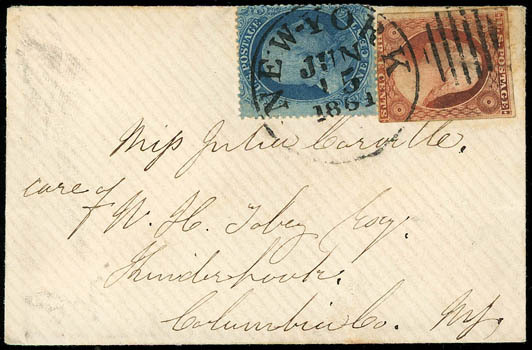 1857, 3¢ dull red, type III cover group, reference balance of over 105 covers; nice array of townmarks, includes a group of partial captured imprints and 7 covers with stamps plated from the top row of plate 20, other items plated, double rate usages, couple interesting cancellers, etc. 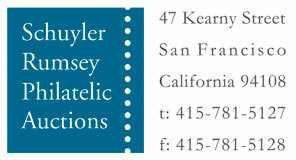 ; condition varies, generally F.-V.F (no photo). Scott No. 26 Estimate $150 - 200. 1857, 3¢ dull red, type IV, collection, specialized collection mounted on pages comprising 16 singles (15 used and 1 unused), one pair on piece, and 17 covers, study shows clear breaks including interrupted line and portion of next stamp up to breaks on all four corners, range of covers from various towns including a very fine use from "Susquehanna Depot, Jan 4" and guideline single tied by blue "Elmira N.Y. Aug 6 1857" cds to Chemung N.Y.; few faults to be expected but overall a nice clean collection, F.-V.F., A neat specialized study of the 3¢ Type IV. Scott No. 26A; $6,055 Estimate $1,000 - 1,500. 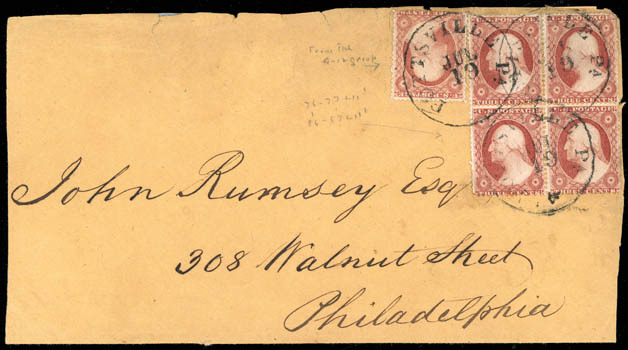 1857, 3¢ dull red, type IV, positions 76-77L11i/86-87L11i, used with 3¢ dull red (26) single, all tied by three strikes of "Pottsville Pa. Jul 19" cds on reduced legal-size cover to John Rumsey, Philadelphia Pa.; small stamp and cover faults, Fine and exceptionally rare used block on or off cover. Scott No. 26A $2,500 as off-cover block.